Prohibited trade, marketplace or merchant activities as defined in a relevant anti-trust or such other restraint of trade statute. Anti-trust legislation is designed to prevent businesses from price-setting or other secret collaboration which circumvents the natural forces of a free market economy and gives those engaging in the anti-trust conduct, a covert competitive edge. "Antitrust is a distinctive American means for assuring the competitive economy on which our political and social freedom under representative government in part depend. These laws have helped release energies essential to our leadership in industrial productivity and technological development. They reinforce our ideal of careers open to superior skills and talent, a crucial index of a free society. "Competition is also desirable on principle and for its own sake, like political liberty and because political liberty is jeopardized if economic power drifts into relatively few hands. "Intellectual and artistic creativeness can be imperilled by the quality of sameness imposed on us when standards of thought and form are delivered into the hands of a few businessmen." The use of the word trust is unfortunate as the statute does not directly deal with trust except, perhaps, a political statement in regards to public confidence in the marketplace. In most other jurisdictions, restraint of trade legislation is known as anti-combines or competition legislation. Intentional reduced prices in order to increase prices. 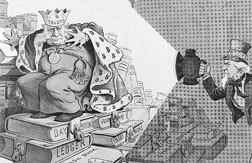 "Antitrust laws apply to virtually all industries and to every level of business, including manufacturing, transportation, distribution, and marketing. They prohibit a variety of practices that restrain trade, such as price-fixing conspiracies, corporate mergers likely to reduce the competitive vigor of particular markets, and predatory acts designed to achieve or maintain monopoly power." "The Sherman Antitrust Act ... outlaws all contracts, combinations and conspiracies that unreasonably restrain interstate and foreign trade. This includes agreements among competitors to fix prices, rig bids and allocate customers. "The Sherman Act also makes it a crime to monopolize any part of interstate commerce. An unlawful monopoly exists when only one firm controls the market for a product or service, and it has obtained that market power, not because its product or service is superior to others, but by suppressing competition with anti-competitive conduct. "The Act is not violated simply when one firm's vigorous competition and lower prices take sales from its less efficient competitors—that is competition working properly."